Heavy rains since Saturday threw life out of gear in Mumbai and Maharashtra with several parts of the state remaining under water till late this evening. As many as 15 persons have been killed in the state so far in rain-related incidents. 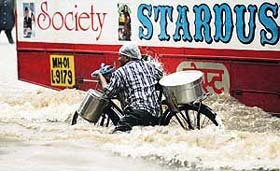 A man pushes a bicycle as a bus passes by along a flooded road after a heavy rainfall in Mumbai on Sunday. The flood situation in parts of Andhra Pradesh on Sunday remained grim as the toll in rain-related incidents mounted to 51. As the Godavari river continued to flow above the danger mark, more than 350,000 people in about 160 villages in Khammam district were hit by flash floods. The Andhra Pradesh Government has agreed to release Krishna waters to Tamil Nadu from the Telugu Ganga project from August 15. Chief Minister Y.S. Rajasekhar Reddy gave an assurance to this effect when a ministerial delegation from Tamil Nadu met him here yesterday. The Central Information Commission has flayed the Central Bureau of Investigation for its tardy probe into the Bofors pay-off case, while rejecting the application of former Union Minister Arun Jaitley seeking papers relating to the de-freezing of the bank accounts of the Italian businessman Ottavio Quattrocchi. The CPM state secretariat, which met yesterday at the Alimuddin Street party office, directed both the Chief Minister, Mr Buddhadeb Bhattacharjee, and his former boss, Mr Jyoti Basu, to refrain from making any more statements on the CAB elections vis-à-vis Jagmohan Dalmiya issue. In an unprecedented move, the Andhra Pradesh High Court on Friday issued notices to Chief Minister Y. S. Rajasekhara Reddy and APCC president K. Keshava Rao for contempt of court. The order was issued by Justice P.S. Narayana taking serious note of the remarks made by the Chief Minister and the APCC president against the court last month. Assurances from the Union Government as well as the Oversight Committee that the implementation of 27 per cent reservation for OBCs will not dilute quality notwithstanding, institutions of higher education have proposed varied measures to ensure academic excellence. Concerned over the inordinate delay in acquiring the crucial piece of land from Uttar Pradesh for the construction of the Commonwealth Games village, Parliament's Standing Committee on Urban Development has urged the Delhi Development Authority to start developing infrastructure for the 2010 Commonwealth Games right away on the land it possesses. The Delhi Police today claimed to have cracked the sensational murder case in which seven members of a family were stabbed to death in the Inderlok area. The police claimed that the accused arrested has been identified as Sanjay Babu (28). The police arrested a suspected SIMI activist from Phulwari Sharif in the city for questioning in connection with the July 11 Mumbai serial blasts. The police said Ziauddin Ansari, who allegedly had links with the banned SIMI, was taken into custody late Friday night. In a city, where strays breed in every street corner, the Brihanmumbai Municipal Corporation has decided to fine owners of pet dogs that dirty Mumbai’s streets. As per BMC’s new draft rules, owners of pet dogs will be fined Rs 500 if they do not clean up after them. The Bangalore Golf Club is situated in the most prestigious area in the city, bang close to three five star hotels, minister quarters and the Chief Minister’s residence. This is proving to be its nemesis. Keen to reap electoral dividend on its decision to implement OBC quota in higher education institutions, the Congress is taking steps to take the message to the grassroots level before the crucial Uttar Pradesh Assembly elections next year. The Congress today announced that Mr Rahul Gandhi would be accompanying Congress president and his mother Sonia Gandhi to formally launch the party’s campaign in Uttar Pradesh. Timely action averted a flare-up of communal violence in Mau last night when mischievous elements damaged some calendars inside a mosque in the Niaz Muhammadpura locality in the already tense city. Indian scientists are developing life-saving drugs for dreaded diseases from depths of the ocean, the medicine chest of the new millennium. The research programme “Development of potential drugs from the ocean” has been initiated by the Ministry of Earth Sciences for diseases like cancer, diabetes, dyslipidemia, malaria, tuberculosis, central nervous system disorders, anti-infective and anti-fertility. The controversial Malaysian cruise liner “Blue Lady” was recently granted permission by the Environment Ministry to beach at Alang for dismantling. The ship had been allowed to anchor near Pipawav Port in Amreli district by the Supreme Court on humanitarian grounds. A meeting of the Union Cabinet has been called early tomorrow morning to approve the Action Taken Report, along with the report of the Justice Pathak Inquiry Authority, ahead of their tabling in Parliament. He sings quawaalis to ensure two square meals for his family of five and begs to solemnise the marriages of poor and deprived girls. This is the incredible story of the 50-year-old blind-by-birth beggar Mohammad Yakub from Deohara village of Aurangabad district in Bihar who, unlike many others, begs for a social cause. An NGO, Campaign Against Child Labour, has welcomed the Centre’s decision to ban employment of children in the domestic sector and demanded strict enforcement of the law to make it effective. Vrindavan gears up for birth anniversary of Lord Krishna. Movies 'Darwaza Band Rakho', 'Shaadi Karke Phas Gaya Yaar' running successfully. The Met Department said heavy rains were recorded in many parts of western Maharashtra. It has predicted more rain with gusty winds. Mumbai saw transport services being thrown out of gear as roads and subways remained flooded. Trains on the Western and Central Railways’ lines had to be cancelled this morning as the tracks were waterlogged. However, it being a holiday, most of the residents of the city were not affected. The traffic, even in the interiors of the city, was badly hit after waterlogging was reported in many neighbourhoods, including Andheri, Milan and Khar subways. The traffic police said roads were submerged around the Sion Circle area, Hind Mata Chowk and Chunabhatti areas in central Mumbai. Air services were disrupted after flights to and from the Chhatrapati Shivaji International Airport were cancelled. According to an airport official visibility was down to 300 metres only. The Disaster Management Cell of the state government has warned residents not to venture out unless necessary since heavy rains may continue. Across Maharashtra, the deluge continued. In Pune, heavy rains caused the main rivers, Mula and Muthha, to flow above the danger mark. The authorities issued a flood alert with 25,000 cusecs of water being released from the Khadakvasla dam. In Nanded district, more than 13,000 persons were evacuated from marooned villages. In the Marathwada region some 25 villages were still cut off completely by floods, officials said. In Vidarbha’s Gadchiroli district the Army, the Navy and the Air Force have been called in to conduct rescue operations. The traffic on the Nanded-Nagpur-Akola-Hyderabad road has also been halted. The IAF choppers were pressed in after the Godavari river crossed the danger mark. The Vishnupuri dam was opened to accommodate the excess water in the river. “ We have stepped up our rescue and relief operations in the flood-hit areas of Maharashtra, Andhra Pradesh and Chhattisgarh, despite the inclement weather,” IAF spokes man Wing Cdr Mahesh Upasni said. The IAF had carried out 102 sorties, rescuing hundreds of people and heli-lifting, using Dhruv, Chetak and Mi 8 choppers, over 75 tonnes of relief material, he said. The flood situation in parts of Andhra Pradesh on Sunday remained grim as the toll in rain-related incidents mounted to 51. As the Godavari river continued to flow above the danger mark, more than 350,000 people in about 160 villages in Khammam district were hit by flash floods. The rains and floods have left about half a million people homeless since Friday. While it has not been raining in several affected areas since Saturday evening, the heavy inflows in Godavari and Krishna due to incessant rains in upstream Maharashtra and Karnataka were causing concern. While the situation was improving in north coastal Andhra, which bore the brunt of floods during the past three days, things have not improved in parts of Telangana and south coastal districts. The water level in Godavari at the temple town of Bhadrachalam in Khammam district Sunday crossed 66 feet, against the danger mark of 53 feet, posing a threat to the town and several villages surrounding it. The district authorities have pressed into service 13 boats and two helicopters to evacuate people from marooned villages. About 13 families in Konavaram near Bhadrachalam are standing on the roofs of their houses waiting for help. Two more helicopters have been sought from Eastern Naval Command, which has its headquarters in Visakhapatnam. Officials said food and water packets were also being dropped to the marooned people. Chief Minister Y.S. Rajasekhara Reddy, who undertook an aerial survey of the flood-hit areas of Vijiyanagaram and Khammam, asked authorities to be ready to meet any eventuality. He announced a compensation of Rs.50,000 each to the families of those killed in the rains. "According to our estimates, 531 houses have collapsed due to the rains. The state government will get all of them rebuilt," he said. More than 70,000 persons have been shifted to relief camps in Khammam alone. The flood situation in Adilabad district bordering Maharashtra also remained grim with the water levels rising in Penganga and Pranhita, inundating more than 200 villages. Traffic on national highway 7 connecting Hyderabad to Nagpur has come to a standstill. In the coastal districts, authorities discharged huge quantity of water into the sea from Prakasam barrage across Krishna river in Vijayawada. The Andhra Pradesh Government has agreed to release Krishna waters to Tamil Nadu from the Telugu Ganga project from August 15. Chief Minister Y.S. Rajasekhar Reddy gave an assurance to this effect when a ministerial delegation from Tamil Nadu met him here yesterday. The seven-member delegation, comprising Rural Development and Local Administration Minister M.K. Stalin and Public Works Minister K. Ponmudi and senior officials, held discussions with state officials for the supply of Krishna water to meet the drinking water requirements of Chennai. “Last year, we had released 3.7 tmc of Krishna waters to Tamil Nadu. This year, we are hopeful of releasing more water,” Mr Reddy said at a joint press conference with the visiting Tamil Nadu ministers. During the talks, the Tamil Nadu delegation pleaded for an early release of water since the water stored in reservoirs catering to Chennai’s needs would last only a month. The Chief Minister responded positively to Tamil Nadu’s request for increasing storage levels in Somasila and Kandeluru reservoirs in Nellore district to meet the needs of Chennai on time. Mr Reddy said his government would take up the issue with the new Krishna Water Tribunal for the need for upper riparian states of Karnataka and Maharashtra to keep their commitment of providing 5 tmc ft of Krishna water each for Chennai. The Central Information Commission has flayed the Central Bureau of Investigation (CBI) for its tardy probe into the Bofors pay-off case, while rejecting the application of former Union Minister Arun Jaitley seeking papers relating to the de-freezing of the bank accounts of the Italian businessman Ottavio Quattrocchi. “The CBI is directed to expedite the investigation in the matter lest its credibility should get unduly tarnished,” Information Commissioner Prof M M Ansari in his 15-page order said. “The CBI has been investigating the case for nearly 16 years without much success. Though the CBI has claimed exemptions from disclosure of information on valid grounds....these exemptions would not be available after the expiry of 20 years of such public action under the provisions of the Right to Information Act,” he observed. Mr Jaitley, a Rajya Sabha MP, had sought all documents, manuscripts and files pertaining to the freezing of bank account Nos 5A5151516M and 5A5151516L, maintained at London by Ottavrio Quattrocchi and his wife Maria Quattrocchi, by the Queen’s High Court in January this year. The money in these accounts was withdrawn the day London court passed the order. The agency informed the commission that it was still investigating the source of funds from Switzerland to London and a letter of Rogatory had been issued by the court of Chief Metropolitan Magistrate, Delhi, in April this year and is under execution. “When the court is duly seized of the matter and prosecution has started the case, the exemption from disclosure of information under section 8(1)(h) of the Act has been correctly applied by the CBI Appellate Authority,” the commission said in its decision. The CBI informed the commission that the bank accounts were freezed for a limited period by the order of the court in London to enable the CBI to determine the sources of funds and to ascertain whether the money attributable to the receipt as commission from suspected sources was credited in those accounts. “The action of freezing of the accounts was taken on the basis of suspicion of having received the commission, which could not be verified and proved by the CBI till now,” the agency told the commission. The investigating agency told the CIC that Mr B Dutta, Additional Solicitor-General, was deputed to appraise the Crown Prosecution Service (CPS) of the UK about the progress made by the CBI with regard to its investigation. “Subsequently, the said accounts were defreezed on the advise of the Queen’s High Court to the bank concerned. The CPIO also mentioned that Dutta has not made any written submission to the CPS nor did he advise them on the matter in any form,” the agency contended. However, this was objected by the applicants representative, who claimed that Dutta had advised them for de-freezing the accounts, which got revealed when a fax message was received from CPS indicating the advise to CPS given by Dutta to which a confirmation was sought from the CBI. The CBI had registered a case in January 1990 under various sections of IPC and Prevention of Corruption Act on allegations of a criminal conspiracy during 1982-97 to the extent of Rs 64 crore in the purchase of 410 FH-77 guns from A B Bofors. The FIR was registered based on the source information and the report of Joint Parliamentary Committee, Report of Comptroller and Auditor General of India and others. Both leaders made contradictory statements on the recent CAB elections bringing the rift inside the CPM into the open, thus affecting the party’s image. After the two-hour-long meeting arranged at the instance of Mr Basu, the party secretary, Mr Biman Bose, told mediapersons that “disputes over the CAB elections vis-à-vis Dalmiya episode” had been resolved. He said, henceforth, neither Mr Bhattacharjee nor Mr Basu or other CPM leaders would make any public statements in this connection. The party would also not get involved in the CAB matter or in the matter of any other sports organisations, he added. Incidentally, the Chief Minister had projected the city police chief, Mr Prasun Mukherjee, as his candidate against Mr Dalmiya in the CAB elections. Initially, he wanted Mr Dalmiya not to contest the election but the request was turned down. In the elections, Mr Dalmiya finally won, which the Chief Minister felt was his defeat. And soon, the angry Chief Minister made some objectionable remarks on Mr Dalmiya’s victory saying “the evil had won over the good”, obviously hinting at those supporting Mr Dalmiya, who is close both to Mr Basu and the state Sports Minister, Mr Subhas Chakraborty. Mr Basu strongly objected to the Chief Minister’s public statement over the CAB elections, which were free and fair and held under the supervision of a former HC Judge. He also did not approve of the CM’s decision of projecting the city police chief in the CAB elections. In an unprecedented move, the Andhra Pradesh High Court on Friday issued notices to Chief Minister Y. S. Rajasekhara Reddy and APCC president K. Keshava Rao for contempt of court. The order was issued by Justice P.S. Narayana taking serious note of the remarks made by the Chief Minister and the APCC president against the court last month. The single judge order was in response to a letter written by Mr V. Rama Rao from Khammam who drew the court’s attention to the comments made against the High Court. The alleged comments were made by Mr Reddy and Mr Rao while reacting to certain observations made by Justice Narayana against the State Election Commission (SEC) during the disposal of a writ petition. The judge was reported to have commented during the hearing of a petition that the appointment of the SEC had become a farce and lacked transparency. In a strongly worded response, the Chief Minister, at a press conference, said the remarks appeared to have been made to benefit the Opposition party. Justice Narayana, while issuing the show-cause notice, said the government should have taken recourse to appeal instead of making insinuating remarks against judge. APCC president Keshava Rao had rubbished the proceedings in the court last month. In the interim report submitted to the Oversight Committee, the Group on Agriculture-Education Institutions has proposed additional coaching. An additional budget has been sought by the group for establishing a communication, language and soft skills lab. The Engineering and Technology Group has recommended that determination of the admission criteria may be left to the JAB for the IIT or the respective Board of Governors with minor variations within a specified range to be decided by the respective class of institutions. The group has specifically noted that the “cut-off figures should not be lowered to accommodate or fill the reserved seats”. Apart from remedial classes to bring OBC students on a par with other students, the group notes “curriculum framework can be devised for such programmes at the institutional level”. The Group on Management Education said the programmes in IIMs and NITIE, relevant to the OBC quota, were “all postgraduate programmes”. It has sought reservation to be extended to the two-year PG Diploma Programme and equivalent programmes only as other programmes like Fellow Programme, Executive Development Programme and Faculty Development Programme may require work experience, sponsorship etc. Apart from remedial programmes based on the deficiencies of the students admitted under quotas, the group has demanded that IIMs and NITIE which were established as Centres of Excellence remain so. “There must be no unjustifiable demands on the institutes to lower admission standards in order to accommodate the enhanced intake,” the group said. The Group on the Central Universities echoing similar views had in its report stated: “The OBC quota should not be taken as an arithmetical exercise covering multi-faceted expansion. Concerned over the inordinate delay in acquiring the crucial piece of land from Uttar Pradesh for the construction of the Commonwealth Games village, Parliament's Standing Committee on Urban Development has urged the Delhi Development Authority (DDA) to start developing infrastructure for the 2010 Commonwealth Games right away on the land it possesses. The Commonwealth Games village, which is to be constructed near the Akshardham temple on the banks of the Yamuna in East Delhi, is being delayed as a crucial piece of land, measuring 41.3 acre, belonging to the Irrigation Department of the Uttar Pradesh Government is yet to be acquired. The committee, in its report, expressed concern that if the land from the UP Government was not acquired at the earliest, it would be very difficult to carry out development work for the games within a short span of five years. While acknowledging the efforts made by the DDA for acquiring the piece of land, the committee desired that at the same time the matter should be sorted out expeditiously at the highest level because of constraints of time and the importance attached to the games. The committee was of the view that the Cabinet Secretary should intervene to sort out the issue, or if found necessary, the matter could be sorted out at the ministerial level also. However, it recommended that whatever the land the DDA possess right now, should be developed without waiting for the acquisition of land from the UP Government. The DDA comes directly under the Ministry of Urban Affairs because of the limited statehood status of the national Capital. Meanwhile, the government of the National Capital Territory of Delhi is attaching considerable importance to the Commonwealth Games. The Delhi Police today claimed to have cracked the sensational murder case in which seven members of a family were stabbed to death in the Inderlok area. 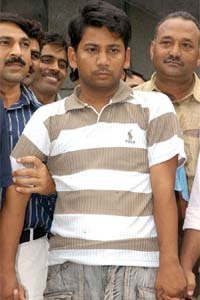 The police claimed that the accused arrested has been identified as Sanjay Babu (28). He was a relative of the deceased family. Delhi Police Commissioner Dr K. K. Paul said at a press conference, called here today, that the accused confessed to his crime, although the weapon of crime and the blood stained clothes the accused was wearing on the night of the crime, were still to be recovered. “The accused had thrown the clothes in a adjoining drain and we are trying to recover them. The accused has confessed his crime,” said Dr. K.K. Paul. It is apparent that the police arrested the accused merely on his statement and with lack of strong evidence. According to the police officials, the accused entered the house of the deceased at around 10.30 pm on July 30. He stayed there for the night and allegedly killed the entire family one by one by slitting their throats during the night. Dr Paul said the postmortem report had confirmed that no sedatives were given to any of the deceased. Dr Paul said the deceased Santosh was mausi (maternal aunt) of Sanjay. Sanjay and his family, including brothers and sisters, used to live in the same house jointly some years back. But they had an altercation and left the house. Sanjay wanted to settle the scores as he felt insulted at that time. Meanwhile, Sanjay also got the information that Om Prakash was into money laundering business and had Rs 30,000 in his house. The police said on the fateful night, he had planned to take the money. Dr Paul said Sanjay, after entering the house, first killed his uncle Om Prakash and then Santosh Rathore, his aunt, by slitting their throats. He hid their bodies under a cardboard on the ground floor and went upstairs where five of their children — Manju (19), Preeti (17), Dolly (15), Puja (14) and Anuj (8) — were present. When the children asked Sanjay about their parents, Sanjay reportedly replied that he had sent them to bring some goods from outside. Sanjay asked all five of them to sit outside the room and reportedly called them one by one inside the room on the pretext that he was performing a ‘puja ceremony’ and slit their throats. Surprisingly, all the five children, four of them grown up, did not put up a resistance even after seeing their siblings lying dead on the floor. He also set the bodies of his uncle and aunt on fire. This, according to the police, he did because he wanted to destroy the evidence. The police have also claimed to have recovered Rs 20,000 from his possession. The police arrested a suspected SIMI activist from Phulwari Sharif in the city for questioning in connection with the July 11 Mumbai serial blasts. The police said Ziauddin Ansari, who allegedly had links with the banned SIMI, was taken into custody late Friday night. Ansari’s detention followed a request from the Anti-Terrorist Squad (ATS) of the Mumbai police, which suspected his involvement in the blasts in Mumbai suburban trains that claimed more than 200 lives. The ATS personnel were expected to arrive in Patna shortly to take Ansari to Mumbai for further interrogation. A fortnight ago, the ATS along with the Bihar police had arrested two prime suspects, Mohammad Kamal and Khaleel Aziz, of the Mumbai blasts from Madhubani near Indo-Nepal border in Bihar. The arrest of three suspects in connection with the Mumbai blasts from Bihar, including Ansari, was preceded by the reported arrests of around 12 suspected ISI agents from different parts of the state in the past few years. A series of events reportedly has raised serious apprehensions about Bihar having common international borders with Nepal and Bangladesh, may be fast emerging as a new terrorist hub in the eastern part of the country. In a city, where strays breed in every street corner, the Brihanmumbai Municipal Corporation (BMC) has decided to fine owners of pet dogs that dirty Mumbai’s streets. As per BMC’s new draft rules, owners of pet dogs will be fined Rs 500 if they do not clean up after them. According to Mumbai’s Additional Municipal Commissioner R.A. Rajeev, who is the brain behind the proposal, hefty fine will be levied on people dirtying the roads. “We will have mobile squads to levy fine ranging from Rs 500 to Rs 10,000,” says Rajeev. As per new rules, residential housing societies will be held responsible for garbage dumped in their neighbourhood. Fine of up to Rs 10,000 may be levied collectively on the residents of such buildings. At present, residents are required by law to segregate garbage and deliver it for collection by BMC’s garbage trucks. The civic body had removed open bins on the roadside two years ago after notifying garbage collection timings. However, slum residents still dumped garbage where the old bins stood. The BMC says things will now get better with the amount of fine being increased. Earlier, those urinating or defecating on the streets were fined Rs 50. Now they will have to pay Rs 500. “We will have at least 400 employees on the roads to enforce the law,” says Rajeev. The BMC has 80 nuisance officers at present. Cynical residents, however, feel that enhanced fine will only corrupt nuisance officers who will pocket heavy bribes. Civic employees unions are, however, gung-ho about the proposal and indications are that many employees will volunteer for the post of nuisance detectors. According to the biggest union, Municipal Mazdoor Union, employees are waiting for a notification to be issued asking for volunteers. The Bangalore Golf Club is situated in the most prestigious area in the city, bang close to three five star hotels, minister quarters and the Chief Minister’s residence. This is proving to be its nemesis. As if stray balls hitting cars cruising alongside it was not enough, the last straw seems to be a lofty shot which dented the car of Chief Minister H. D. Kumaraswamy. The High Grounds police, under whose jurisdiction the club falls, had dispatched a letter to the Deputy Commissioner (Urban) on July 25 asking him to order the closure of the club. The missive was sent because a golf ball hit a policeman standing on duty at the Chief Minister’s residence on July 22. A golfer, Subiah, was arrested on charges of negligence after a complaint was registered in the matter. Even as the police was looking into the matter, a more serious incident occurred. Mr Kumaraswamy’s car was hit by a ball on August 3 when it was moving in a convoy towards his residence alongside the golf course. After initial panic, security men realised they were not under attack but a golf ball was responsible for the impact on the car. This time the errant golfer got away as the security personnel could not locate the ball which club authorities said was coded with an identification mark which could have helped in tracing the hitter. However, the golf course management was targeted by the city police. A case has been registered against the management today as well as the “missing” golfer. Additional Commissioner of Police Bipin Gopalakrishna told TNS that the police has been consistently asking the golf club management to take steps to prevent such incidents but to no avail. He said it was up to the club management to increase the height of the netting along the Sankey Road, besides other measures which could include restrictions during peak traffic hours. There have been other cases of stray balls hitting cars and pedestrians. In the second week of July a driver of a Karnataka High Court judge was injured when a stray ball hit him while he was walking along the ministerial bungalows adjacent to the club. Six more cases of damages to vehicles as well as injuries have been recorded by the police, even though it says the number could be much higher as many cases go unreported. The club was on the outskirts of the city when it was established 150 years ago. However, it now lies in the heart of a VIP area. The narrow road on both sides of the club is chockablock with vehicles at all times during the day. The state government has earlier proposed shifting the club to the outskirts of the city but the move has not been taken up till yet. Golfers say shifting the club was no answer and would harm their interests. “The central location of the club is one reason why we can have a daily round without much inconvenience,” says Arun S Kumar. He said efforts could be made to replace the old netting as well as increase its height to prevent balls from going out on the road, besides ensuring beginners did not play during peak traffic hours. The party’s OBC department, headed by Mr K.C. Lenka, is implanting plans to set up committees in every block of the state by the month-end to spread the message about the party’s concern for the welfare of OBCs. Each of the committees, being set up at block, district and state level, will have a chairman, two vice-chairman, three conveners, besides executive members. An OBC mahapanchayat will be held in Lucknow next month in which Congress president Sonia Gandhi and party MP Rahul Gandhi are expected to participate. One of the tasks given to the block committees is to tell people in villages about the steps the Congress governments have taken for the welfare of OBCs and other weaker sections. The AICC general secretary, Mr Ashok Gehlot, said the MP from Amethi would attend the August 8 Kanpur rally along with Mr Gandhi. The Congress is kicking off its election campaign in Uttar Pradesh, which is scheduled to go to the polls early next year, with the Kanpur rally. Mr Gehlot announced that Ms Gandhi would be addressing four rallies in different regions of the state in the next one month. The dates and venues of Ms Gandhi’s other meetings would be decided later. Mr Gehlot’s announcement comes a day after PCC chief Salman Khursheed’s statement that Mr Rahul Gandhi would lead the party in Uttar Pradesh and the party would mould itself according to his plans. The Congress has already indicated that it may go it alone in the Uttar Pradesh Assembly elections. An FIR has been registered against two persons in this connection. According to District Magistrate P. Guruprasad, the incident occurred at around 9 p.m. last night when a calendar inside a mosque in the Muslim-dominated locality was found damaged. Within no time a large mob collected on the roads. However, an alert force headed by the DM and the SP arrived on the spot and the situation was diffused after an assurance to bring the guilty to book. The city had witnessed violence and has remained tense since the murder of local BJP leader’s son Ankit Kumar Soni on August 2. According to IG (Varanasi Range) A.C. Sharma, several persons have been detained for interrogation. Meanwhile, senior BJP leader Kalraj Mishra declared that the government was protecting the murderers of the class IX student as they owed allegiance to the SIMI. Meanwhile, the district administration is also gearing up to ensure that the proposed visit of Chief Minister Mulayam Singh Yadav to the city on August 8 passes off peacefully. Indian scientists are developing life-saving drugs for dreaded diseases from depths of the ocean, the medicine chest of the new millennium. The research programme “Development of potential drugs from the ocean” has been initiated by the Ministry of Earth Sciences for diseases like cancer, diabetes, dyslipidemia, malaria, tuberculosis, central nervous system (CNS) disorders, anti-infective and anti-fertility. So far, over 6,500 marine samples have been screened and three potential drugs, CDR-34-D-123 for anti-diabetic, CDR-134-F-194 and CDR-134-D for anti-diabetic-cumanti-hyper-lipidemic activities-identified. The project has been designed to cover exploratory and product-development phase with participation of pharmaceutical industries. Pharmacological, toxicological and clinical trials for anti-diarrhoeal, anti-diabetic, anti-cholesterol leads would continue further. Under the exploratory phase, bulk and repeated collection of marine organisms and their bio-evaluation are being carried out to obtain potential leads. While human trials have already been initiated for the development of anti-diabetic drug on CDR-134-D-123, the other two compounds are in different stages of pre-clinical investigations. The scientists had now also identified molecular targets for screening anti-cancer leads from marine resources, Minister of Earth Sciences Kapil Sibal told Lok Sabha today. An MoEF official confirmed that the letter for the go-ahead had been faxed to the Gujarat Maritime Board on recommendations of the Supreme Court Technical Committee, which the MoEF received on August 1. With the decks having been cleared for dismantling “Blue Lady”, formerly S.S. Norway, at the Alang ship breaking yard, ways to dispose of the embedded asbestos are being discussed at a meeting of Gujarat Pollution Control Board (GPCB) and Gujarat Maritime Board officials in Gandhinagar. The decision, however, will give rise to some more controversy on the contentious issue as environmentalists are now planning to move the apex court, terming it an “illegal order” and gross violation of the Supreme Court order of June 5. As per Indian Platform on Ship-breaking activist Gopal Krishan, Supreme Court has only directed the technical committee to grant permission for anchoring and not beaching. Following protests from environmentalists, who maintained that the ship was carrying toxic asbestos material and PCBs that were hazardous to health, the apex court, on June 5, directed that the ship could not be dismantled unless it was properly examined by an expert agency. A meeting of the Union Cabinet has been called early tomorrow morning to approve the Action Taken Report (ATR), along with the report of the Justice Pathak Inquiry Authority, ahead of their tabling in Parliament. The meeting would take place just an hour before the Lok Sabha and the Rajya Sabha are scheduled to be reconvened at 11 am after they were adjourned on Friday following protests by the Opposition on the leakage of the Justice Pathak report to the media. The government is expecting a stormy day ahead with the Opposition set to make the leakage of the report a major political issue. Deliberations of the Cabinet would also be taking place in the backdrop of former External Affairs Minister Natwar Singh, indicted in the report on the Iraqi oil-for-food scam, giving a privilege notice against Prime Minister Manmohan Singh. Finance Minister P. Chidambaram and his team of officials virtually burnt the midnight oil to prepare the ATR within 72 hours of the report’s submission to the government. Justice Pathak report is a 110-page document, including 32 pages of annexures. Mr Karunanidhi argued that reservations had been denied to the OBCs since 1950 in educational institutions, state-run-units and the Central administration. “Delayed social justice is denied human rights for the OBCs,” he observed. He sings quawaalis to ensure two square meals for his family of five and begs to solemnise the marriages of poor and deprived girls. This is the incredible story of the 50-year-old blind-by-birth beggar Mohammad Yakub from Deohara village of Aurangabad district in Bihar who, unlike many others, begs for a social cause. The officials of the district administration said till date Yakub had used his ‘earnings’ of 18 years to solemnise the marriages of more than 50 destitute and orphan girls. Besides, he also helped financially in the construction of both mosques and temples. The day of this philanthropist beggar begins early by begging in buses and prominent localities. Most of the people willingly oblige him because his reputation for benevolence through begging has already travelled far and wide. Like any father, Yakub also does not want his children to resort to begging in future. Both his children study in a nearby madarsa. Being blind, he cannot count his income. He thus puts all his income in biscuit cans and when they are full, he donates the money for a good social cause. For Yakub, “ to die rich is a disgrace” and he says he would like to die as a beggar only supporting social cause. An NGO, Campaign Against Child Labour (CACL), has welcomed the Centre’s decision to ban employment of children in the domestic sector and demanded strict enforcement of the law to make it effective. CACL national convener Ranjan Mohanty has demanded the government to prepare a time-bound action plan to completely eradicate child labour from the country. He said banning child labour in homes, hotels, restaurants, tea shops, resorts and dhabas by enlisting these as prohibitory sectors under the Child Labour Act 1986 had been a long pending demand of the CACL. However, a mere law would not help until it was strictly implemented, accompanied with necessary rehabilitation package for children rescued from different sectors, he added.